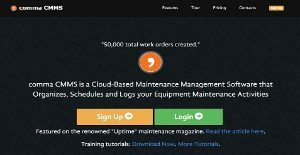 comma CMMS is a cloud-based, open-source maintenance management platform that offers all the tools required to get the job done at an affordable price. It offers a number of tools to help effectively manage assets, including scheduled preventive maintenance, asset tracking, and maintenance history. It works well for all type of organizations whether small, medium, or large. The software includes work planning, preventive maintenance, job management, mobile access and reporting & statistics. It’s also highly customizable, allowing users to configure it according to their specific requirements. Its open API (Application Programming Interface) differentiates it from other solutions, allowing organizations to develop or connect their own software to comma CMMS seamlessly. It’s a comprehensive solution that helps organizing, scheduling and logging all equipment maintenance activities. One of the most notable benefits of the software is that it’s open source and Open API. This means organizations can easily connect their field equipment to comma CMMS API to generate work requests according to real-time field conditions. Being feature-rich doesn’t mean software has to be costly, and that’s exactly the philosophy comma CMMS follows. It’s priced such that organizations from small to big can benefit from dedicated maintenance management software. The comprehensive set of customizable user-group permissions can be used to control all system options, allowing companies to tailor it according to their specific requirements. Being a cloud-based solution, it’s seamlessly accessible from any mobile device with an internet connection and a browser. The software automatically adjusts according to the size of device’s screen, thanks to responsive technology. The work order module allows managing the work flow and maintenance logs for easy retrieval. Users can also add recommended tasks, email notifications, spares and other documents and tools that make the whole process even more efficient. comma CMMS allows to create work orders automatically and manually, while automatic work-orders can be triggered based on a schedule or counter-cycle. It also allows aggregating work on job plans which include a PM tool and overall work-reports. Reporting and statistics module features easy retrieval of information as well as powerful statistics and insights into the data. This allows near to real-time information for smarter and more informed decision making. It's crucial to realize that hardly any software in the Maintenance Management Software - CMMS category will be a perfect solution able to match all the goals of different company types, sizes and industries. It may be a good idea to read a few comma CMMS reviews first as certain services may dominate exclusively in a really narrow group of applications or be prepared with a very specific type of industry in mind. Others can operate with an intention of being simple and intuitive and as a result lack complex functions needed by more experienced users. You can also find software that support a large group of customers and give you a powerful feature base, but that in most cases comes at a more expensive price of such a service. Make sure you're aware of your needs so that you choose a software that has exactly the elements you look for. How Much Does comma CMMS Cost? We realize that when you make a decision to buy Maintenance Management Software - CMMS it’s important not only to see how experts evaluate it in their reviews, but also to find out if the real people and companies that buy it are actually satisfied with the product. That’s why we’ve created our behavior-based Customer Satisfaction Algorithm™ that gathers customer reviews, comments and comma CMMS reviews across a wide range of social media sites. The data is then presented in an easy to digest form showing how many people had positive and negative experience with comma CMMS. With that information at hand you should be equipped to make an informed buying decision that you won’t regret. What are comma CMMS pricing details? What integrations are available for comma CMMS? comma CMMS is an open API platform that blends easily in every software infrastructure.